Welcome back, I hope you all had a great Christmas! I'm sure you've heard by now about the snow that has graced the East Coast.. it fell here in Charlotte and it was so beautiful! Of course I had to take a picture of the first snowfall in our house. Christmas was a good one with my side of the family out here. We ate a lot and visited more family and overall it was a great day! I LOVE having my dad here to visit - he is very handy and has already installed our dining room chandelier. I'll be sure to share pictures soon! Awww... soooo beautiful! Your house is so pretty. I love all the white! so gorgeous! it was flurries all weekend but sadly it didnt stick! The trees look so pretty. Your house wears snow very well! So classic. So gorgeous Bryn! I just sent you and email too! Sounds like a wonderful Christmas! Wasn't the snow so pretty on Sunday morning; our neighborhood is a winter wonderland too- lots of snowmen and forts. Charlotte was due for white Christmas and I'm glad you got to enjoy it here with family! Your home is so beautiful, especially in the snow! Hope you had a merry Christmas with your family! 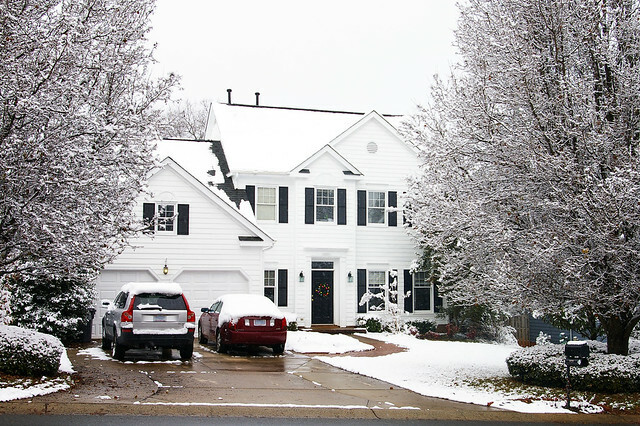 Your home is so gorgeous and looks perfect with the dusting of snow! I also adore your white tree- just seeing it now and what a find- congrats on that one! Your house is so gorgeous! Oh my gosh! I adore your home. It's stunning! I've always loved white homes like that. What fun to have a white Christmas! I love your house. Would you come to Nashville and decorate for us? Please oh please oh please? Ahh what a pretty snowy Christmas! Nice! I just moved from Charlotte last year and snow is rare around those parts! Glad to see you got some during the holiday. LOVELY....i miss the snow so much..!! :) Gorgeous house too! Your house looks beautiful with the snow!